I’ve been a little obsessed with scones, lately. I wanted to find the definitive scone. The scone to best all scones. The one scone to rule them all. What I discovered is that I just seem to like all scones, and most of all the one I’m eating! This week it’s my Dried Blueberry Lemon Scones. Dried Blueberry Lemon Scones are tender and moist and just a bit crumbly. Very scone-like. They’re loaded with blueberries and the slight lemony flavor is intensified by the glaze. It’s those blueberries that steal the show. though. There’s just something about dried blueberries. They’re like soft, squishy little flavor bombs. Dried Blueberry Lemon Scones are not as cake-like as my Chocolate Cherry Scones (I miss you guys!!) or as creamy and soft as my Mardi Gras Scones. (There is cream cheese in those.) Dried Blueberry Lemon Scones lean a little more toward the traditional side of scones than either of those. I do have a bit of a secret when I make scones. Or scones other than the Mardi Gras Scones with the cream cheese. I like to use cream or at the very least 1/2 and 1/2. I just think it makes them taste rich without going overboard on the butter. The other secrets shouldn’t be secret at all; they’re just common knowledge. Keep the butter cold, handle the scones as little as possible, and preferably mix by hand. I recently got a scone pan and I love that it helps make beautiful (or as beautiful as a scone can be, lol) bakery style scones, but it isn’t necessary. This particular recipe can be varied in so many ways. Use just about any fruit or berry, dried or fresh. Use the lemon zest if it compliments the fruit. If not, use an extract instead of the zest. Vanilla if you’d like or another if you have it on hand. It seems as if my standard advice for saving on any baking items is to stock up during the holiday sales or pick up at Aldi. Cream and butter are really the priciest of baking items and are often up to half off during the holidays. Freeze the butter and be aware that cream keeps for weeks, unopened, past the “buy by” date. Lemons are often at a great price at Aldi, and sometimes I’ll see dried fruit there. I do like Costco for the dried berries; they’re dirt cheap in heavy, resealable bags. 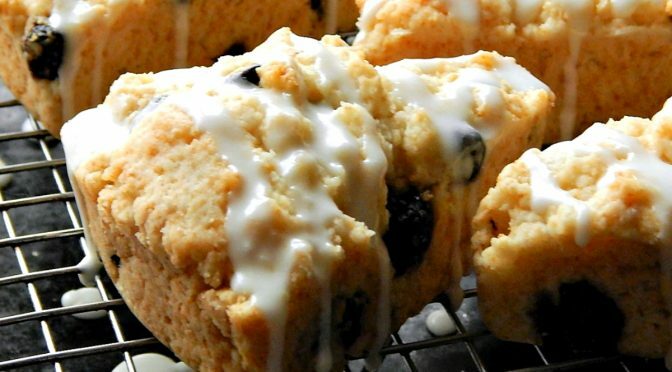 A quick, easy basic scone recipe with the winning flavors of blueberry and lemon. 1 lemon, zested and juiced. 1/2 the zest used in the scones, the rest and 1/4 cup of the juice is used in the glaze, below. Sift together the dry ingredients; the flour, baking powder, salt, and sugar. Add half the lemon zest and mix through. Using hands, 2 forks or a pastry blender, cut in the butter to coat the pieces with the flour. The mixture should look like coarse crumbs with some larger pieces. You’ll know its right when you can squeeze a portion of it in your hand and it sticks together. Add blueberries, then make a well in the center and pour in the cream. Fold everything together just to incorporate; do not overwork the dough. You may need a little less or more cream to make the scones come together. Press the dough out on a lightly floured surface into a rectangle about 12 by 3 by 1 1/4 inches high. Cut in 1/2 then cut the pieces in 1/2 again, giving you 4 (3-inch) squares. Cut each square in 1/2 on a diagonal to give you the classic triangle shape. Place the scones on an ungreased cookie sheet (or into a scone pan, pressing lightly to fill pan). Bake for 15 to 20 minutes until light golden brown. Let the scones cool before applying the glaze. Melt butter in a medium-sized bowl. Add the rest of the lemon zest, then whisk in the confectioner’s sugar until dissolved. Drizzle over scones and let sit for several minutes to let the glaze dry. I often zest lemons when a recipe doesn’t call for the zest and keep it in the freezer. When I make these scones I like to pull some out and use a full tablespoon of zest in the batter and another tablespoon in the glaze. This entry was posted in Click here for Fabulous Food Posts and tagged Breakfast or Brunch Dish, dried blueberries, Dried Fruit, glaze, Lemon, scones. Bookmark the permalink. Very nice, these look so good I want to make them asap! They’re so easy, you should!! And thanks! Oh my gosh…taking a look at my yard and being very grateful it’s too wet to work and we just got back DNA for my Dad for our “little” family history project and walking with the deplorable (as I call him) Chance which is always a work out!! Mostly blogging, though!! Or thinking about it! This new look is causing me no end of issues! ha ha ha! Deplorable sounds like secret code for adorable! Was the DNA any surprise?? My brother and his wife did it– funny that her DNA ancestry was different than her sisters. And I know you’v the blogging Mollie!! You are amazing with how much varied content you have! Well, hope your week looks good ahead… hugs hugs! No real surprises, except my Dad showed a little bit of Nordic ancestry. So we’re assuming it must be some Norse ancestor mixing with the Scottish/British we know about! Hey Mollie– Sounds fun to do– have you done yours?? lol, Jhuls, and thanks for noticing! I’ve been making behind the scenes changes, but I’m still not sure about this. I think it’s slow. And I’m stilll tinkering. We’ll; see!! I love the combination of blueberries and lemons. Your scones look absolutely delicious Mollie! Thank you for bringing them to the party! Happy Fiesta Friday! lol!! Thanks Angie! My Stepmom used to grab baked stuff from Costco! I hated it because they were so large and it impeded MY baking, lol! But even food snob that I am, most of it was surprisingly good. I remember I really had to talk her out of buying this giant pumpkin pie – I mean it was at least a foot and a half across, maybe even closer to two!! And there were three of us, haha!! Very simple Mollie – now I need to make some scones! Perhaps in time for the upcoming royal wedding…. Ha ha – yes I agree! I love scones and blueberry lemon is one of my favorite combos. These look fab! Compared to any place else, it’s a steal. Now that I think about it, I don’t know where else I’ve seen dried blueberries lately except Costco or online! Lemon and blueberry is a wonderful flavour combinaton. Ah, scones! Some people like doughnuts or bagels in the morning-but I am a scone girl all the way! Pining this one for sure, thanks! Love me some scones. I tried my hand at cranberry scones last year and they came out very nice. I’ve always wanted to try making lemon curd and clotted cream from scratch to go along, too. Your lemony ones look delish! Excellent breakfast. Thanks! I have clotted cream on my list of things to make and I keep buying cream for clotted cream and using it for something else!! One day, soon!